OUR OFFICE IS LOCATED JUST OFF COUNTY ROAD 22 NE ACROSS FROM ROCHESTER CENTURY HIGH SCHOOL. EXIT HIGHWAY 52 AT 37TH STREET NW AND GO EAST FOR 3.6 MILES. TURN RIGHT ON 26TH ST NE (BY KWIK TRIP), AND THEN TURN LEFT ON CLARE LANE NE. OUR OFFICE IS STRAIGHT AHEAD AT THE END OF THE CUL DESAC. The Rochester Social Security office is located in Rochester 55906. The following page includes information for this location like the office phone number, hours of operation and driving directions. If you have any interests or comments about your retirement benefits or are interested in making an appointment, call the following Rochester Social Security office. 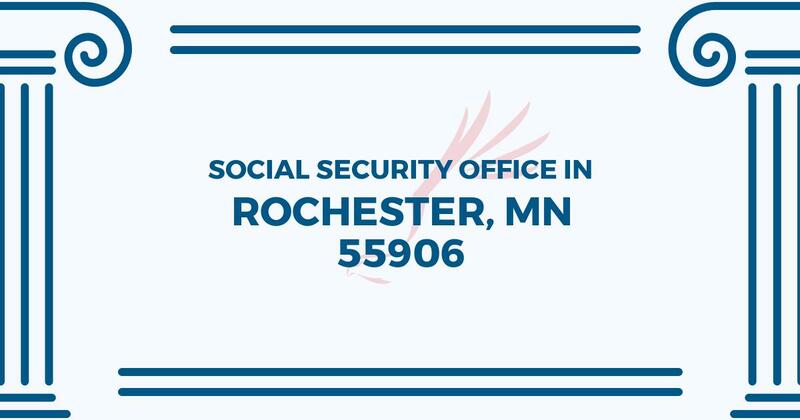 The Rochester Social Security office is located at 2443 Clare Ln Ne Suite 100. The Rochester office offers information, support and services handled by the Social Security Administration. The following page provides information for this location like the office phone number, hours of operation and driving directions. If you have requests or comments about your retirement Social Security benefits, or you need to schedule an appointment, contact the Rochester Social Security office. I’m filing my deceased fathers taxes for 2018 and do not have a copy of his SSA-1099 statement. Can I stop by and pick up a copy? What documentation do I need. His name is Norman Kruger and passed away on 4/9/2018.